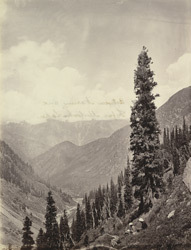 Photograph of mountains between Narung and Saif-ul-Mulk Lake in the North West Frontier Province, now in Pakistan, taken by an unknown photographer in 1865. The Hazara District runs from the Himalayas in the north and towards Rawalpindi in the south. Lake Saif-ul-Muluk is situated at the mouth of an extinct volcano, at an altitude of 11,000ft and provides a breath-taking view of the Malika Parbat ('Queen of the Mountains') at 17,500ft.